Chelsea have set some unwanted records after their disastrous performance against Manchester City so far, this has happened to them for the first time in their history. As well as conceding 4 goals in consecutive top-flight away games for the first time since 1990, Chelsea have managed to achieve an unwanted feat for the first time in the club’s history after their disastrous first-half performance against Manchester City this afternoon. Pep Guardiola’s side put the sword to Chelsea’s defence in the opening 25 minutes of today’s clash and Chelsea’s shields didn’t hold up to the challenge. The Blues have found themselves down 4-0 as a result of three individual errors and a moment of magic from Sergio Aguero. Sarri’s side have failed miserably in their efforts to deal with the attacking prowess on offer from City. 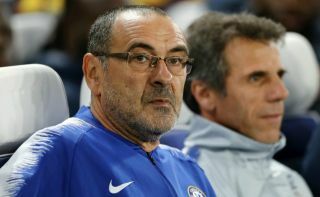 There will be questions asked of Maurizio Sarri’s managerial ability after today’s showing but the Chelsea players need to have a long, hard look at themselves after their performance so far. It’s astonishing to think that at the starting point of the season, the Blues looked as though they could put the pressure on Manchester City and Liverpool in the title race. Fast forward a few months and the side has well and truly fallen off the rails. The Blues need to make drastic changes after this performance and quickly, the West London club could be embarrassed once more by City when the two sides meet in the Carabao Cup final two weeks from now.